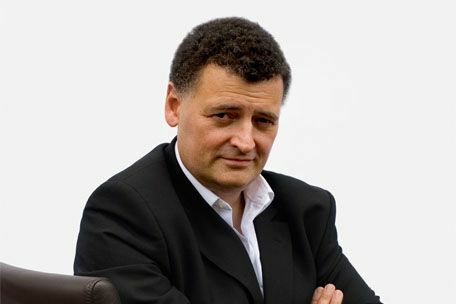 'Doctor Who' showrunner Steven Moffat received a "death threat" after the midseason finale on Saturday night (04.06.11). The writer-and-producer finally resolved a long-standing plotline in the episode when he revealed the character River Song (Alex Kingston) was the adult daughter of married couple Rory Williams and Amy Pond - played by Arthur Darvill and Karen Gillan respectively. However, not every fan of the BBC sci-fi series was impressed with the reveal and several took to twitter to call for Moffat's demise. He tweeted: "Only one death threat, two demands for my immediate resignation, and two for my suicide. IT'S A HIT!! (sic)"
Moffat was unapologetic to fans who complained they had guessed the true identity of River - who has been a recurring character in 'Doctor Who' since 2008 - before the episode, entitled 'A Good Man Goes to War', aired. The 49-year-old writer insisted he always wanted viewers to be able to guess the plot twist. In another post on his twitter page, he wrote: "I'm sure a fair number DID guess. A twist should ALWAYS be guessable - in this case by 8 year olds (who were mostly way ahead!) (sic)"
When the series returns in the autumn, fans will see The Doctor - played by Matt Smith - battle Nazi dictator Adolf Hitler. The next adventure - entitled 'Let's Kill Hitler' - will see the titular Time Lord crash-land in The Fuhrer's office and have to fight the former German leader, who was responsible for World War II.